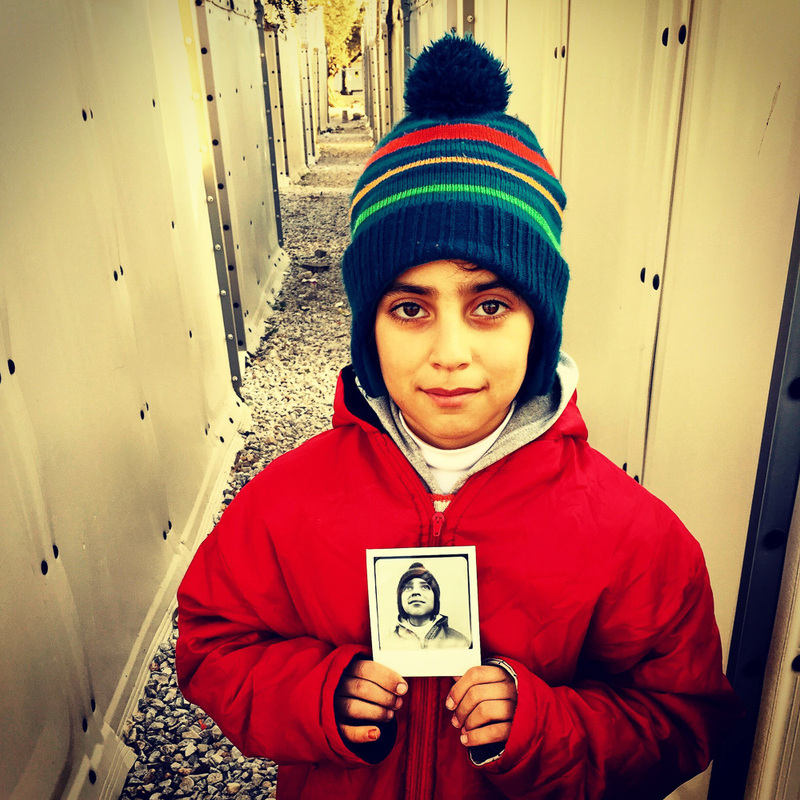 © Jade Beall, Wayne Martin Belger with finished print “Us & Them, Moria #2.” Photo of a refugee woman in the Moria refugee camp in Lesbos, Greece. 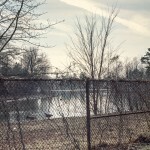 I first discovered the work of Wayne Martin Belger about six years ago doing a Google search for DIY, homemade cameras for a personal project I was working on. 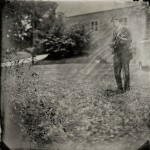 I stumbled upon images of several of his painstakingly crafted pinhole cameras. I remember rushing into the next room with my iPad to show my wife because I couldn’t contain my excitement. I felt the same excitement several years later sitting in a conference room at the Medium Festival of Photography in San Diego when I suddenly realized that the speaker I was waiting for was that same guy who made those amazing cameras and I was going to be able to see them in person. But to characterize Wayne Martin Belger simply as a photographer who makes his own cameras would ignore the depth and complexity of his work. Wayne is a photography-based installation artist whose exhibitions consist of both the hand-made camera and photographs produced by the camera. 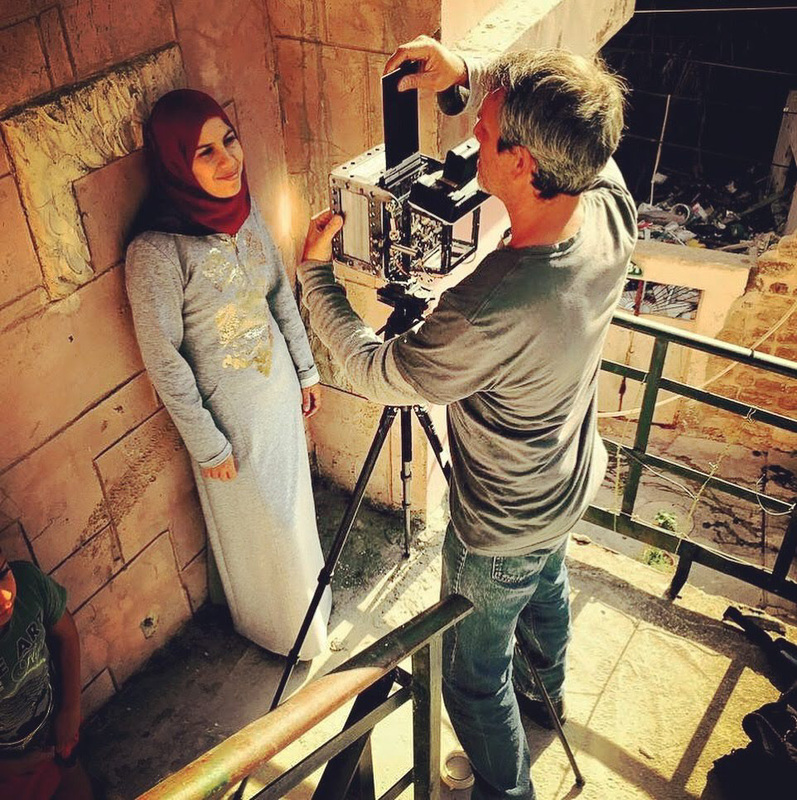 Central to his work and process is his deep personal connection to his area of interest and subjects and the cameras he builds are a key part of that connection. 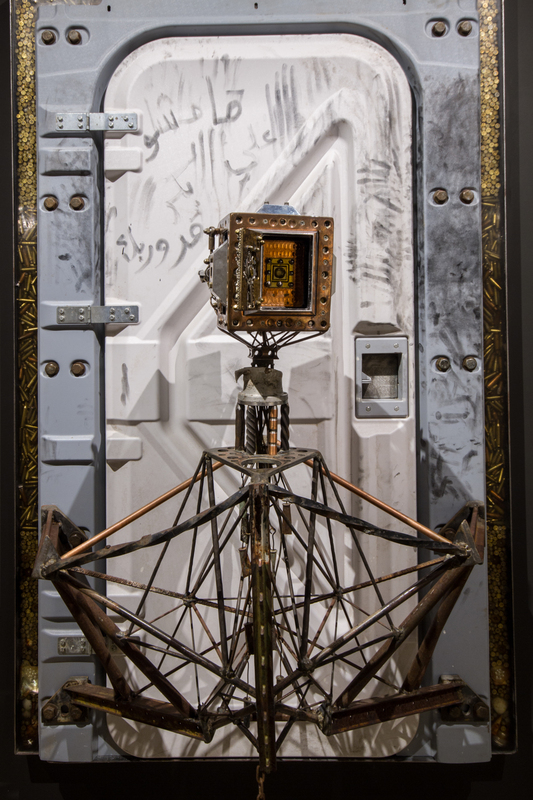 Each camera is created for a specific body of work, containing artifacts specific to that area of study. He created a camera that circulates a sample of HIV-positive blood as its red filter for photographing portraits of people living with HIV. He created a camera that incorporates an infant’s heart in formaldehyde to explore the relationship between mothers and their soon-to-be-born children. © Brian Van de Wetering, The front of the “Us & Them” camera. 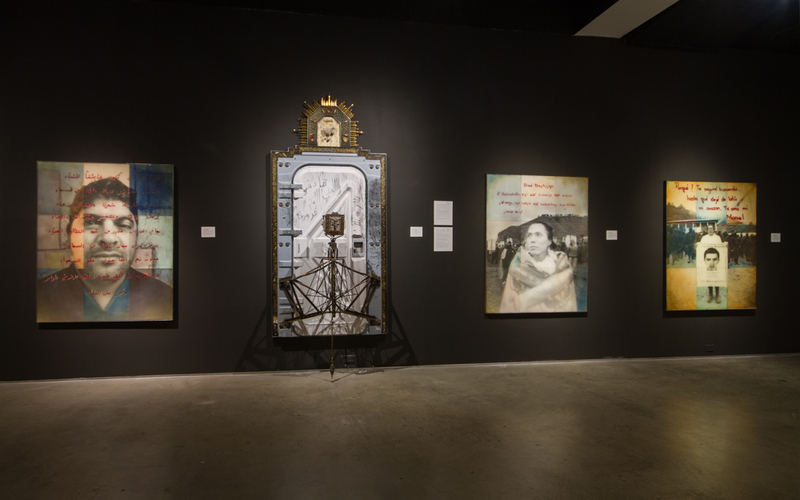 His most recent body of work, “Us & Them,” focuses on the artificial separation, division, and de-humanization that governments and the powerful use to dominate people and preserve their power. 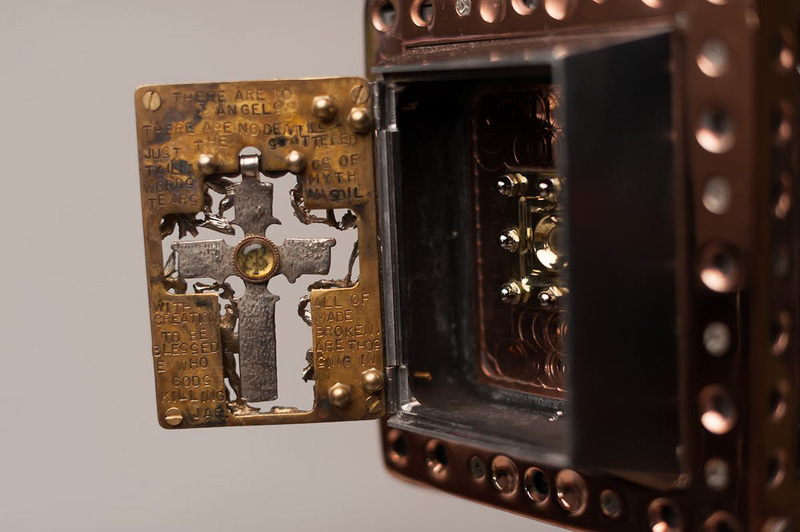 For this project he spent months creating a camera incorporating powerful symbols relating to that dehumanization, including a crucifix once owned by Eva Braun (Hitler’s girlfriend/wife), an armband a Jewish person was forced to wear in WWII, prayer beads from a current-day Syrian refugee, and human remains from the Vietnam war. 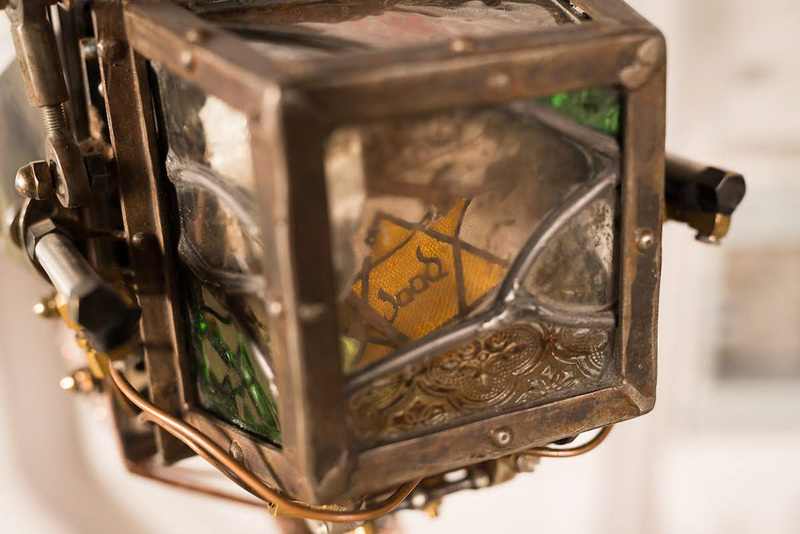 The unique talismans included in his cameras are often given to him by people who hear about his work. 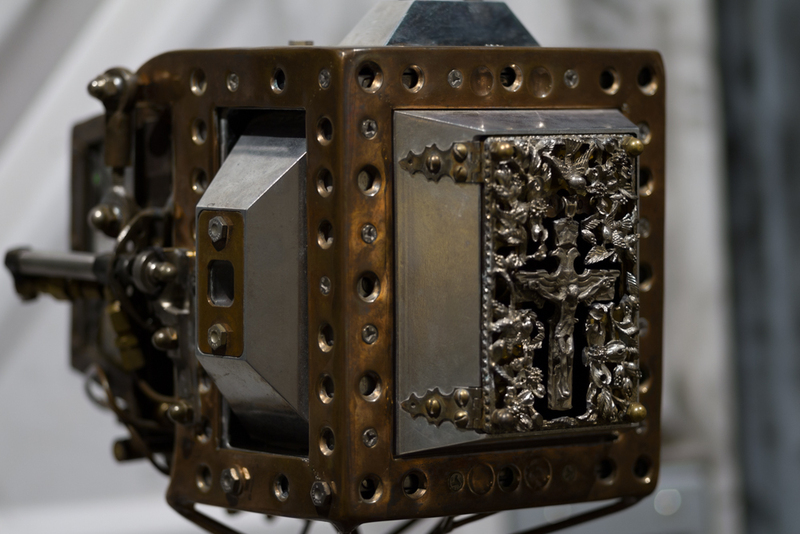 © Jade Beall, Front of “Us & Them” camera with aperture gate open showing the Eva Braun crucifix. © Jade Beall, Back of the “Us & Them” camera. Wayne’s use of these items is rooted in his religious heritage and childhood experience. Wayne has been collecting and assembling powerful spiritual artifacts since he was a child. 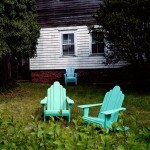 © Brian Van de Wetering, Top of the “Us & Them” installation. 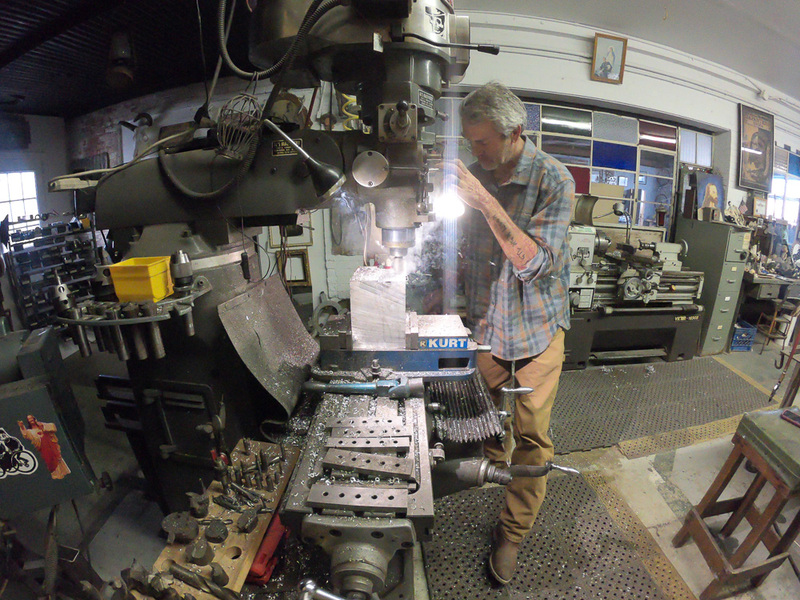 Wayne comes from a long line of engineers and is a master machinist and craftsman. 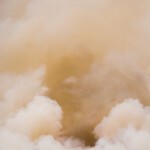 His cameras are exquisitely crafted pieces of functional art and objects of beauty in their own right. They are often decorated with precious and semi-precious stones. And the precision and beauty of the moving parts is astounding. 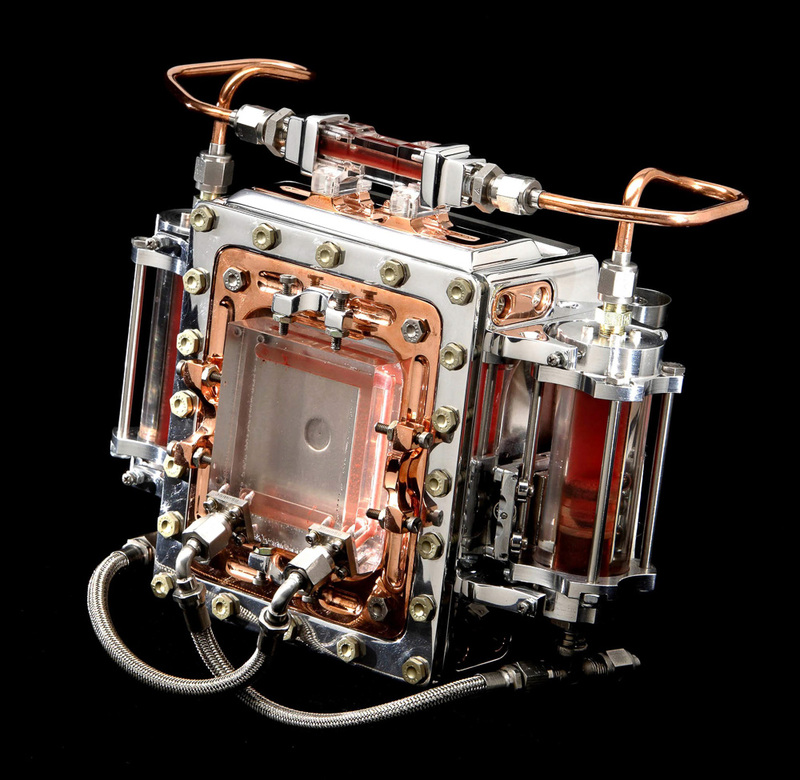 © Brian Booth, The “Untouchable” camera (HIV Blood Camera). 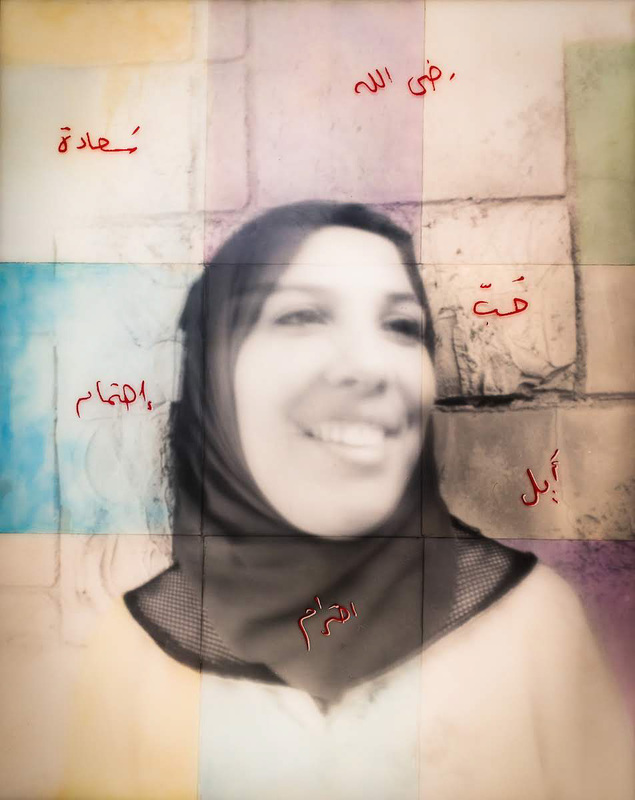 But the cameras are just the beginning of the project — a means of connecting with the area of study and his portrait subjects. 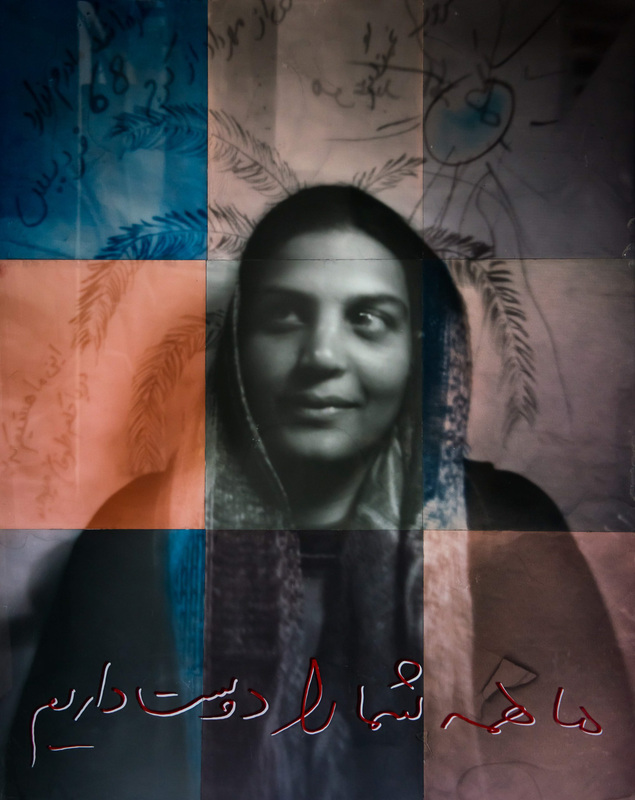 For the Us & Them project, Wayne travelled with the camera and took portraits of people in oppressed and persecuted communities. 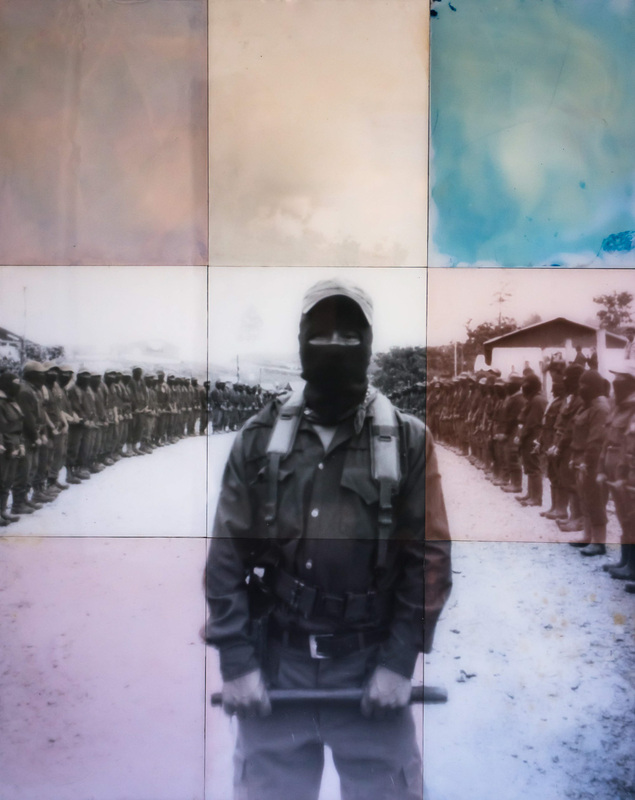 He and the camera have been to Syrian refugee camps in Lesbos, Greece, the Palestinian territories, Standing Rock North Dakota, and the mountains of Chiapas Mexico to photograph the Zapatista National Liberation Army. 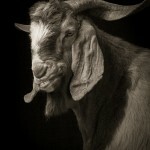 The camera itself often helps him break down barriers with his subjects. 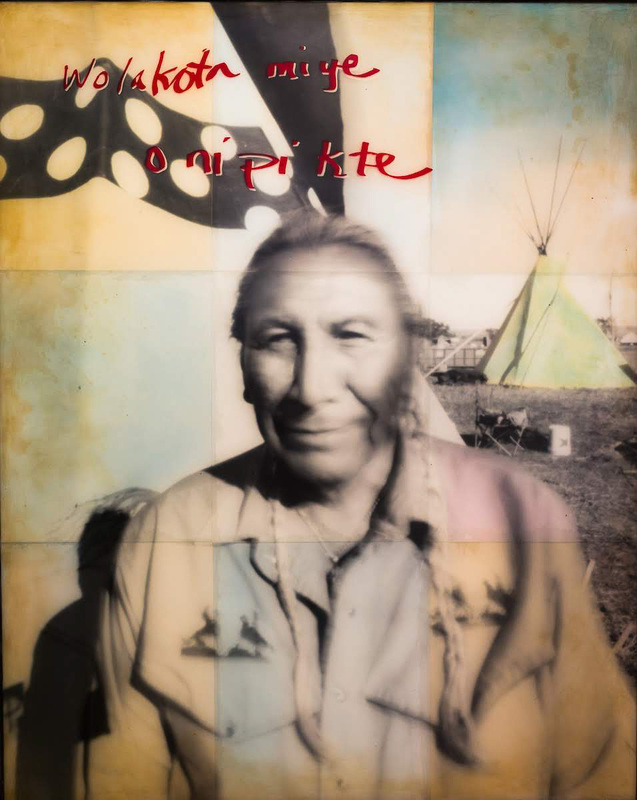 But it is his own dedication to understanding and immersing himself in the circumstances of his subjects that has produced a series of powerful and moving portraits. 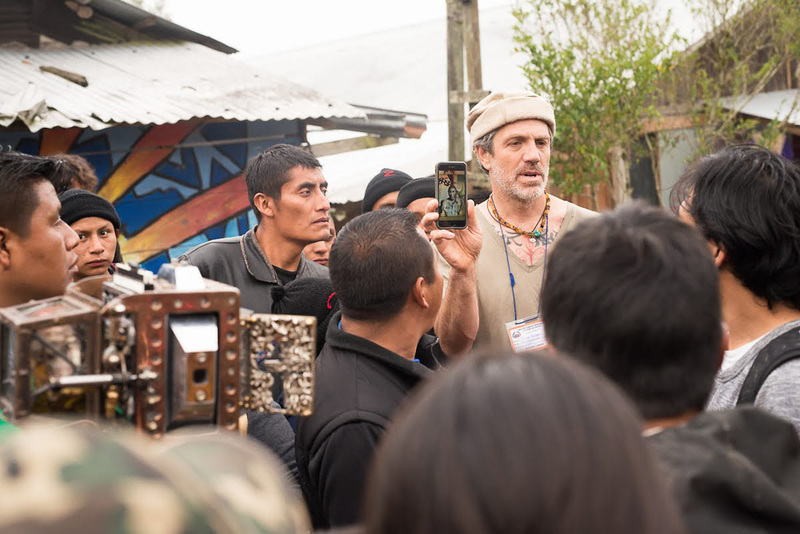 © Jade Beall, Wayne Martin Belger explains the “Us & Them” project in a Zapatista compound in Chiapas, Mexico. 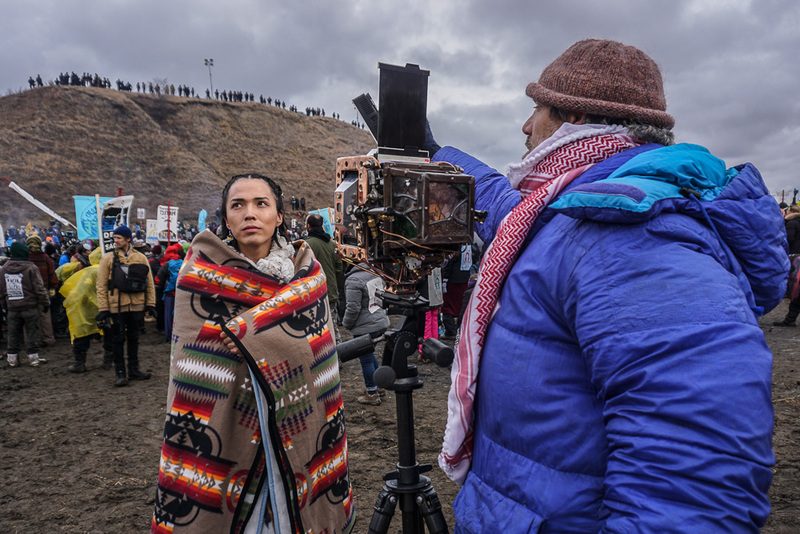 © Ryan Vizzions, “Us & Them” photo shoot of a Navajo woman during a NoDAPL confrontation in Standing Rock, North Dakota. 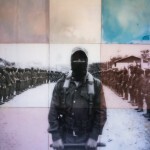 © Jade Beall, “Us & Them” photo shoot of a Zapatista commander and his platoon in Zapatista military compound in Chiapas, Mexico. © Ameer Hassan, “Us & Them” photo shoot in the West Bank, Palestine. © Sandi Sandelier Blankenship, “Us & Them” photo shoot of an Afghani refugee and her baby in the Moria Refugee Camp in Lesbos, Greece. Wayne likes to leave something with each of his subjects. He has outfitted his camera to accept 4” x 5” Polaroid Film as well as 4” x 5” negative film. © Wayne Martin Belger, After “Us & Them” photo shoot in the Syrian refugee camp, Kara Tepe in Lesbos, Greece. The young Syrian boy had just been photographed by the “Us & Them” camera. He’s holding a 4″ x 5″ Polaroid given to him by Wayne. An important part of the Us & Them project is to give a voice and identity to individuals too often identified as “them.” To this end, Wayne asks each of his subjects to write “Words from the Heart” — a message in their own hand. That message is then incorporated into the final print. 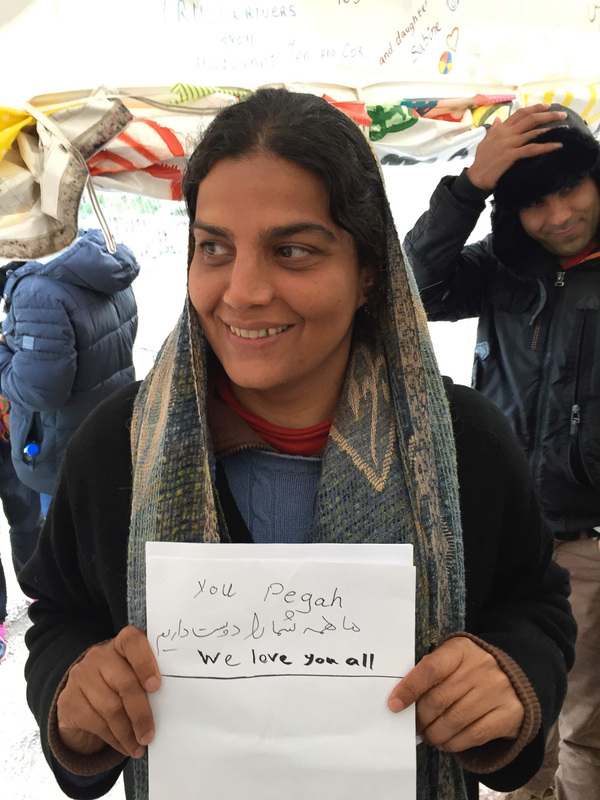 @ Wayne Martin Belger, Afghani woman holding up her “Words from the Heart” after “Us & Them” photo shoot in the Moria refugee camp in Lesbos, Greece. Wayne’s time-consuming printing process is a further example of his skill and dedication to craftsmanship. 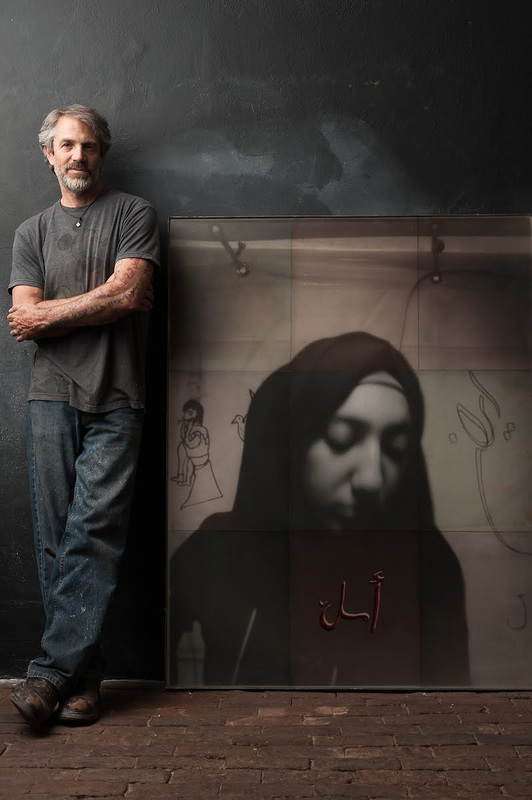 For the Us & Them project, he prints the portraits by projecting the negative onto grid of 16” x 20” photo paper taped to a sheet of foam-core and standing on an easel. Each sheet of paper is then removed and developed and toned separately with different processes so each sheet has a slightly different look. 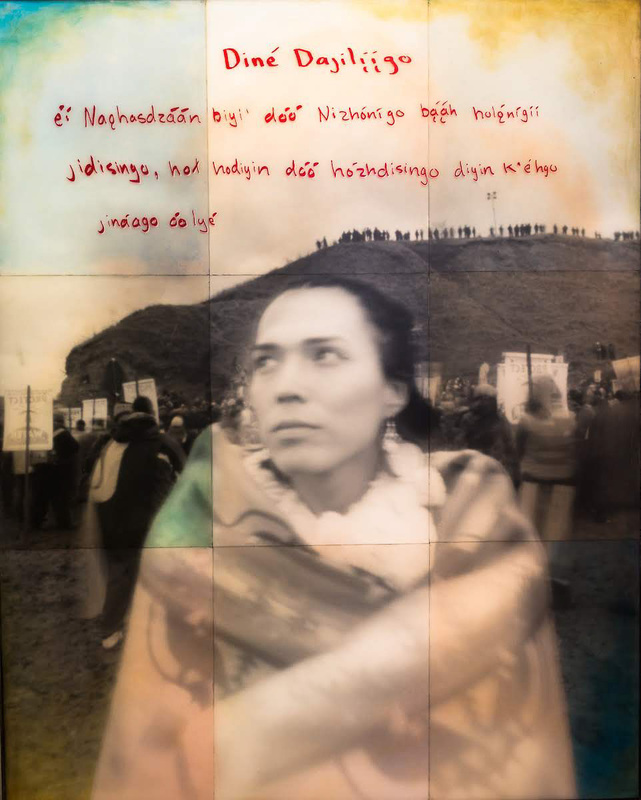 © Wayne Martin Belger, “Us & Them, Standing Rock #1,” 48″ x 60″ print from 9 sheets of 16″ x 20″ silver gelatin paper, toned with cochineal, prickly pear tea, and Zapatista coffee. 1 of 1, 2017 Photo of Chief Arvol Looking Horse of the Sioux Nation taken in the Oceti Sakowin DAPL resistance camp in Standing Rock, North Dakota. 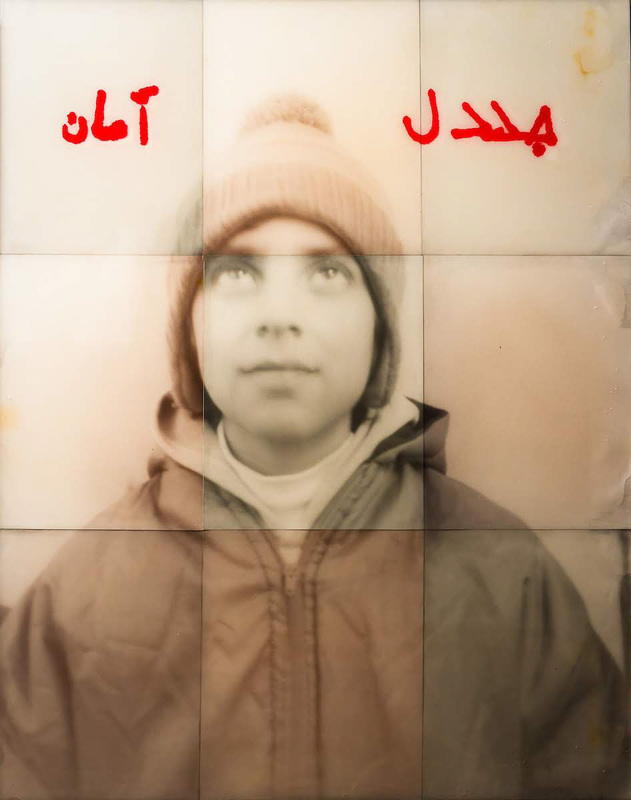 © Wayne Martin Belger, “Us & Them, Moria #2,” 48″ x 60″ print from 9 sheets of 16″ x 20″ silver gelatin paper, toned with cochineal, prickly pear tea, and Arabic coffee. 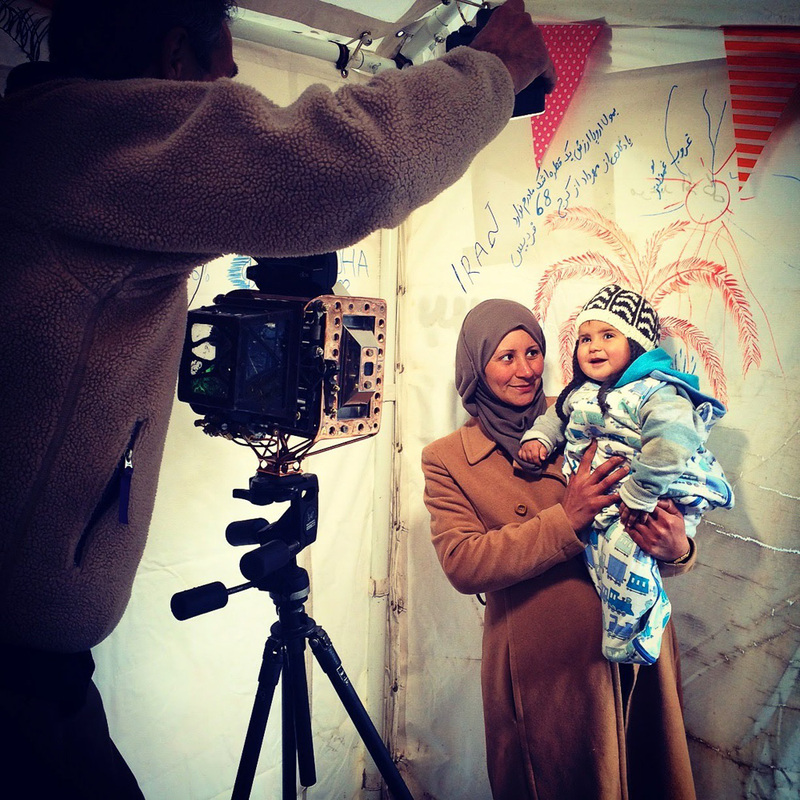 1 of 1, 2017 Photo of an Afghani refugee in the food tent of the Moria refugee camp in Lesbos, Greece. 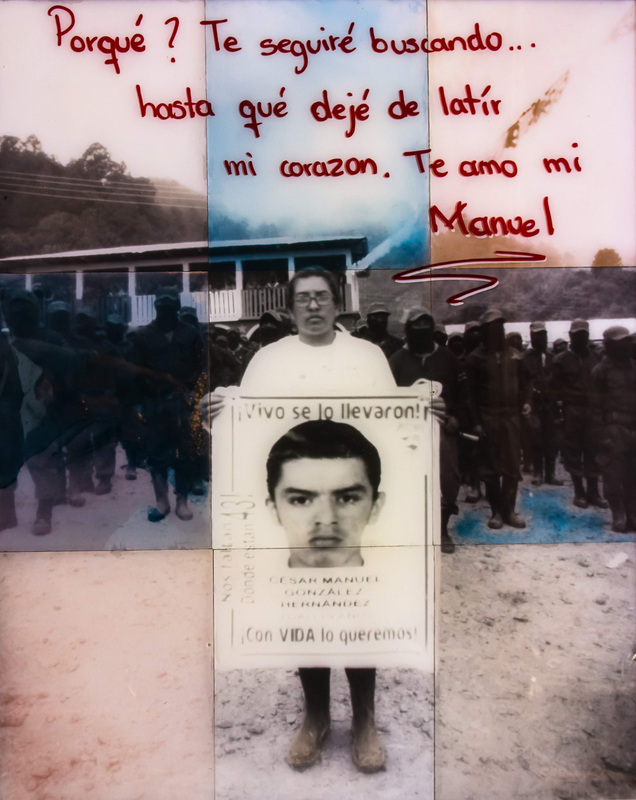 © Wayne Martin Belger, “Us & Them, Zapatista #2,” 48″ x 60″ print from 9 sheets of 16″ x 20″ silver gelatin paper, toned with cochineal, prickly pear tea, and Zapatista coffee. 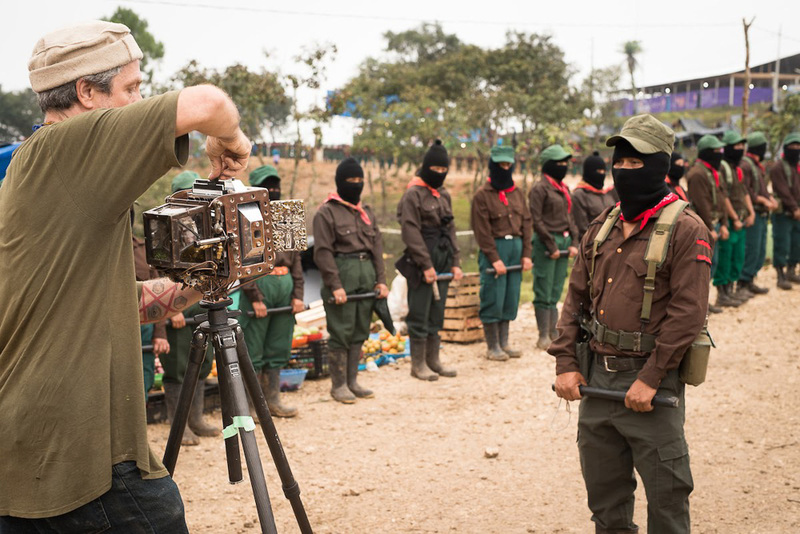 1 of 1, 2017 Zapatista commander with his platoon in a Zapatista military camp in Chiapas, Mexico close to the Guatemalan border. He declined to write a “words from the heart” message for the photo. He was a little busy. Wayne’s exhibition installations bring all of these elements together in one place to create a powerful experience for those lucky enough to see his work in person. In addition to exhibiting the prints and camera together, he creates an altar of sorts for the camera to make it a focal point of the experience. Wayne often incorporates additional artifacts significant to the subject matter of the project into these altars. 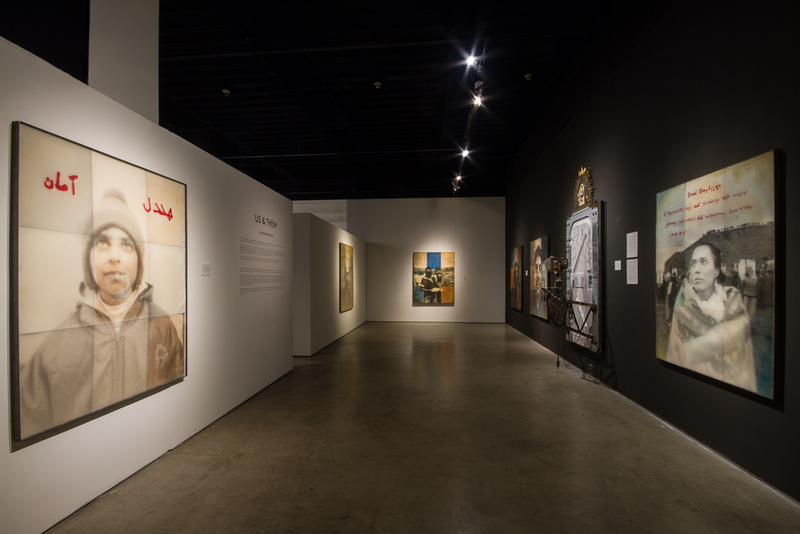 He recently exhibited an installation of Us & Them at the San Diego Art Institute. © Brian Van de Wetering, Detail of “Us & Them” camera installation at the San Diego Art Institute. 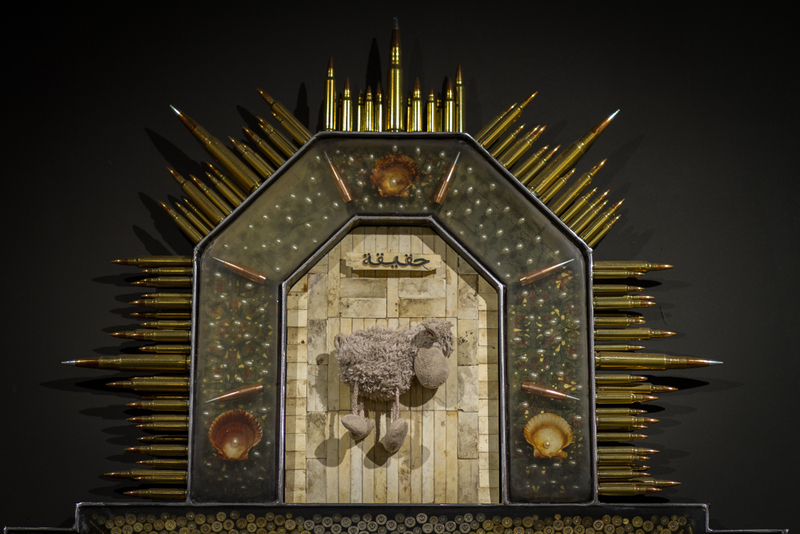 The installation also includes a stuffed animal left behind after unloading a refugee boat, a piece of the fuel line from a German V2 rocket that exploded in London during WWII, a collection of smashed Springfield bullet shells from an Indian/US Cavalry battle in the 1870s, and more. © Brian Van de Wetering, “Us & Them” small museum installation at the San Diego Art Institute. Large museum installations will include 50 to 80 48” x 60” portraits. © Brian Van de Wetering, “Us & Them” museum installation at the San Diego Art Institute. Since the close of the exhibition in San Diego, Wayne and the camera have been back on the road meeting and photographing new communities of marginalized people. 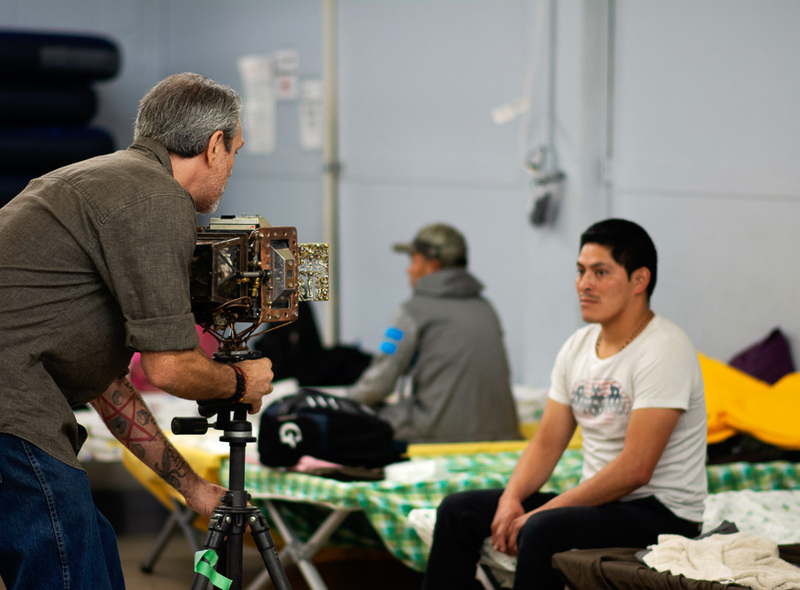 First, there was an “Us & Them” shoot inside an ICE immigration center in Arizona. 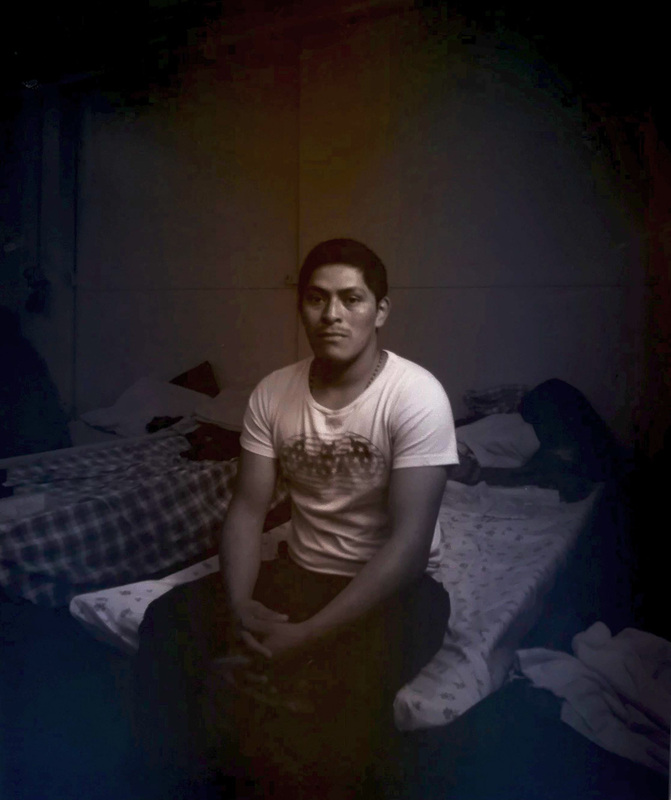 © Shannon Smith, Wayne shoots a portrait of a young man from Honduras in an ICE facility in Arizona. © Shannon Smith, In an ICE facility in Arizona, a young Mongolian child is fascinated by Wayne’s camera. The Mongolians crossed the border with the Hondurans, guilty of nothing more than trying to secure a better life for themselves and their families. © Wayne Martin Belger, Scanned negative from the “Us & Them” photo shoot at an ICE immigration facility in Arizona. 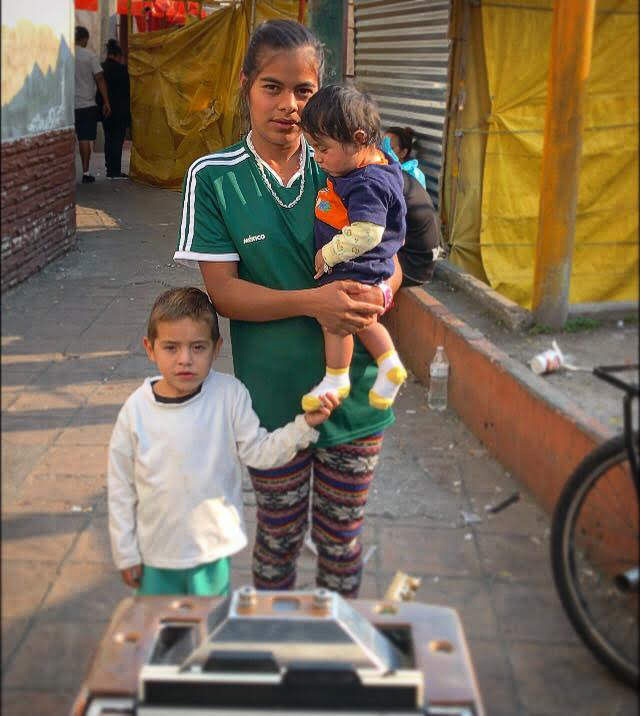 On Thanksgiving Day and Black Friday there were sessions in Mexico City and Tijuana to photograph people in the Migrant Caravans. © Wayne Martin Belger, “Us & Them” Migrant Caravan photo shoot of woman with two children at a migrant housing facility set up by Father Alejandro Solalinda in Mexico City. © Luis Alberto González Arenas, An “Us & Them” photo shoot of Father Alejandro Solalinde. Solalinde is known as “The most recognizable priest in Mexico.” He’s a human rights champion that has survived assassination attempts from the cartels and government because of his commitment to the human rights of migrants. Tragically, the camera and all the undeveloped negatives from these sessions were stolen in Mexico City and have not been recovered. 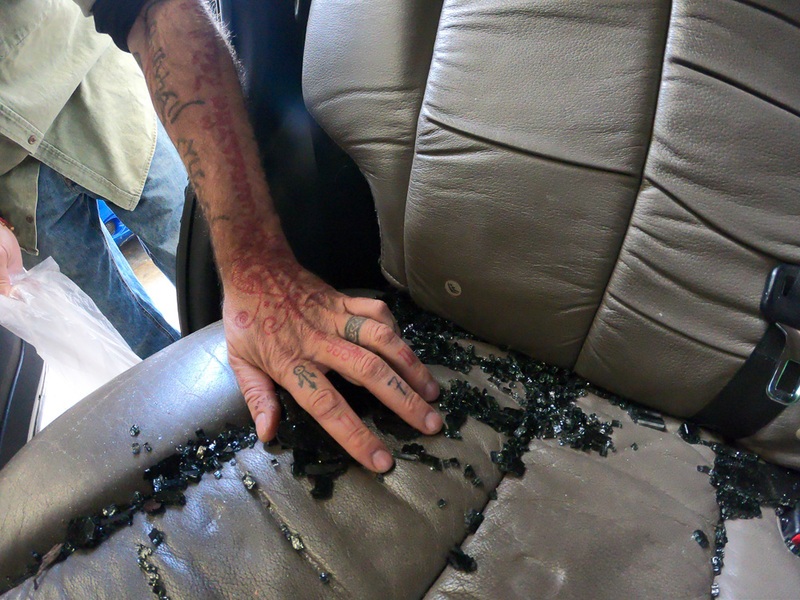 © Luis Alberto González Arenas, Inside the car where the camera was stolen, Wayne collects broken glass to use as an artifact for a new “Us & Them” camera. 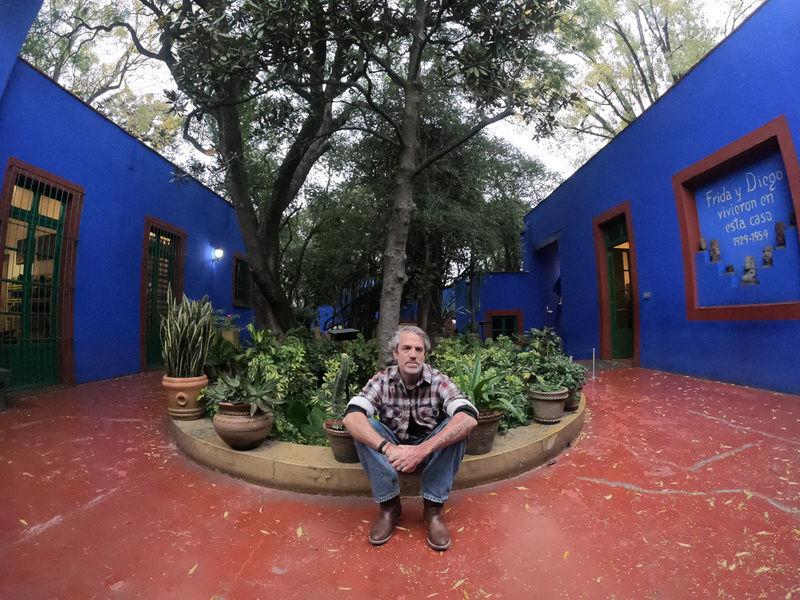 © Luis Alberto González Arenas, Wayne contemplates the future of the “Us & Them” project at Frida Kahlo’s house in Cayoacan, Mexico shortly after the theft of the camera. Wayne has a tattoo on his chest in Aramaic that, in translation, reads: “In Death I Bloom.” After the passing of the initial shock and despair, Wayne has started work on a new camera to continue the project. 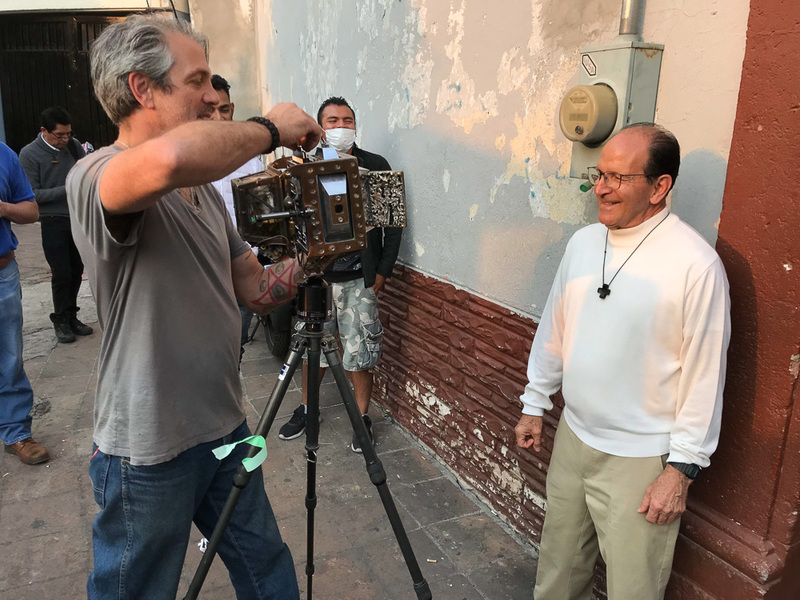 Friends and supporters have already begun sending him artifacts for the new camera, which will include broken glass from the car where the first camera was stolen, black lava rock from a wall built by Diego Rivera, and steel cut from the US/Mexico border wall. © Gabrielle Pietrangelo, Back in his studio, Wayne works on the new “Us & Them” camera. 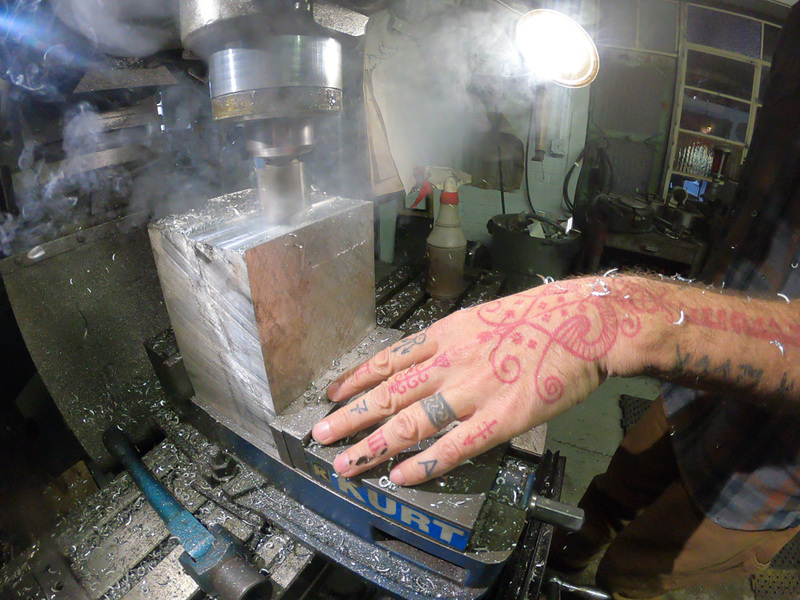 © Gabrielle Pietrangelo, The new “Us & Them” camera begins to take shape from a single piece of solid aluminum.